Hello everyone. As promised, here’s an animal picture. 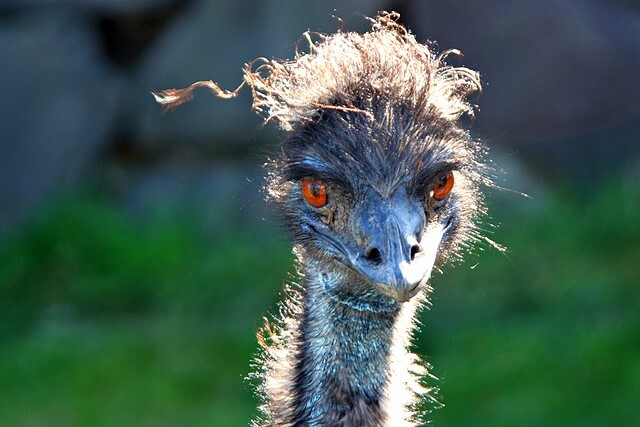 I went with an emu, because they’re funny looking. I love the intense stare with the totally disheveled “hair”. Everything about this guy just screams out “awkwaaaaaaard!” What a ridiculous little animal. This one was taken at the Cougar Mountain Zoo, out in Issaquah. (That’s a suburb of Seattle, for those of you who don’t live out here.) It’s MUCH smaller than the “main” zoo, that being the one in Woodland Park in Seattle proper. But it’s a ton of fun in its own right. Especially if you have kids. They don’t have anything super exotic (they have a couple llamas and a deer though), but you can get right up face to face with the animals (well, most of them. Not the cougars though), and feed them and touch them and make fun of them all you want. For a child who thinks the family cat is just the greatest thing ever, it’s a magical place. There’s no crowds (at least the two times I’ve been there), and parking is super easy. It’s a great way to spend an afternoon. Highly, highly recommended. Following last Friday’s requests (in order received), tomorrow will be something from Colorado. There’s two I’m deciding between, we’ll see what I end up with. Notes: Canon EOS Rebel XT, Tamron 28-300 mm VC lens. 1/30s, f/6.3, ISO 100. Focal length: 184mm. Reminds me of a Dr Seuss character. Love the lighting.